If it wasn’t obvious already from my mini pumpkin cinnamon rolls, mini frittatas, or hash brown cups, I love using muffin tins to cook. If I had to pick one item from my kitchen that I use most, it would have to be my muffin tin. That or my PAM cooking spray but for me the two go hand in hand. 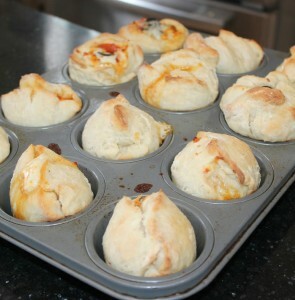 My latest muffin tin creation is these yummy mini pizza calzones I made for dinner last night. When I first got my muffin tins in college, I believed the claim that they were actually “non-stick,” and tried baking cupcakes in the tins without spraying them with PAM. Let’s just say it was an epic fail. I ended up with cupcake tops, which were delicious but not quite what I was going for. 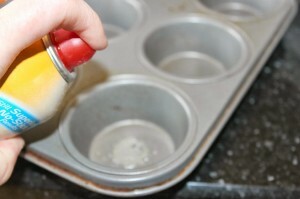 One of my favorite celebrity chefs recommended that when you’re using muffin tins to spray each cup with PAM cooking spray individually rather than just doing a quick spray over the entire pan. I was originally a little nervous about spraying so much onto the muffin tins but with the new PAM having zero calories per serving, why not? So I’ve used that trick ever since and never had an issue with food sticking again. And even better, my muffin tins don’t have the gross residue because the new PAM cooking spray leaves 99% less residue than the bargain brands. And like I said, I use my muffin tins A LOT so the less residue the better. Now, enough about my muffin tins. I’m sure all you really want to know is how you can make those delicious calzones? By the way, have I ever told you the story of the time that I choked on the cheese in the best calzones from Ashburn Cafe? 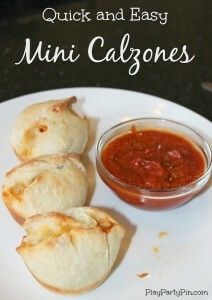 Just kidding, here’s how you make the mini calzones. 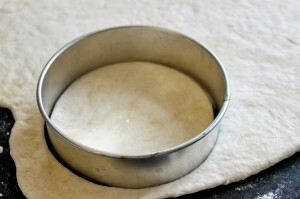 Step 1 – Make (or buy) your pizza dough. I used this great Bobby Flay recipe with one change, spraying the bowl and plastic wrap with PAM cooking spray instead of olive oil while the dough was rising. 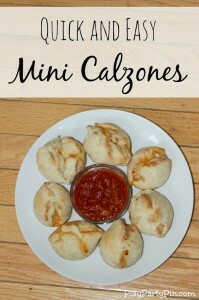 This made the perfect amount of dough to make 12 mini calzones. 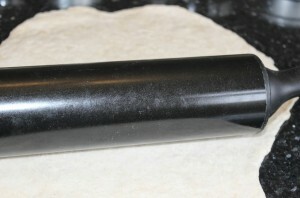 Step 2 – Roll out your pizza dough. Once it’s rolled out to your preferred thickness, cut out circles. 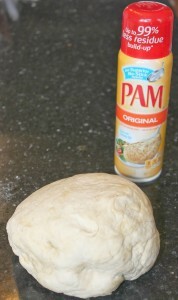 Step 3 – Spray your muffin tin with PAM original cooking spray. Make sure to use my tip above and spray each individual cup well with the spray. 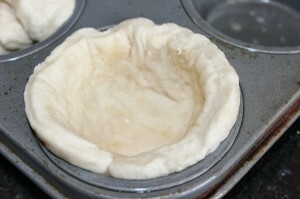 Step 4 – Press one circle of pizza dough into each muffin tin making sure to press it to the bottom and along the sides. 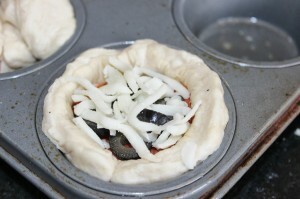 Step 5 – Add your desired toppings. I skipped the sauce inside because I personally like to dip my calzones in sauce. 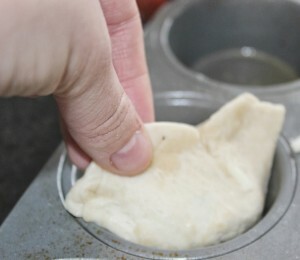 Step 6 – Fold the dough over the toppings and pinch the seam together tightly. 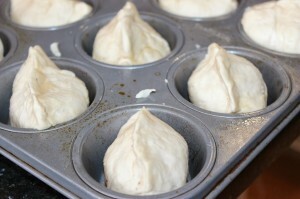 Step 7 – Bake in the oven for 12 minutes at 450 degrees F or until golden brown and dough is cooked. Step 8 – Serve hot with your favorite pizza sauce for dipping. Wouldn’t these be great for a party? 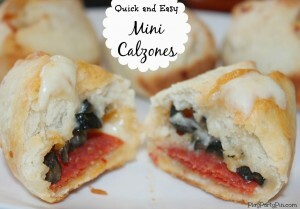 Who doesn’t love pizza and these are perfect for adults and kids both! Even better, why not let people put in their own toppings, kind of like my make your pizza party. Do you use PAM cooking spray as much as me? Want to win a great prize package from PAM that includes a full-sized PAM cooking spray and a gorgeous Le Creuset Pie Dish (ARV = $50)? Just leave a comment with your favorite thing to make in a muffin tin and your email address to enter. **Giveaway ends at 11:59 PM EST on Wednesday, December 11th. Winner must be 18+ years old and live in the continental US. Random winner will be selected using random.org. Winner will be notified by email and will have 48 hours to respond to claim their prize or another winner will be chosen. Full terms and conditions of the sweepstakes. I love the mini muffin tins and pam for brownie bites! I love to make a few flavors of muffins on cold mornings or afternoons for snacks. My email is franipoo71@hotmail.com. Thanks! Favorite muffin tin filler? Lasagna cupcakes!! I like to make my asparagus , ham and scrambled egg mixture in my muffin tin sprayed with Pam , when they are done cooking, I slip them in a plastic Baggie and freeze them . Then in the mornings ,pull one out , breakfast is served !